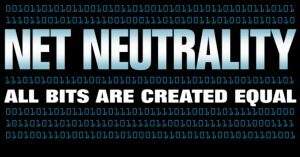 “Net Neutrality” is a disingenuous misnomer, as its meaning has been misrepresented and mischaracterized from its inception. And judging from the hyperbolic statements and overreaction to this week’s announcement that the Federal Communications Commission (FCC) was nixing the government regulation of the internet, all too few of us realize what was at stake with government regulation of what has become the backbone of our communications infrastructure. Conceptually, “net neutrality” sounds meritoriously egalitarian, preventing Internet providers from doling out more bandwidth to some paying customers, like Netflix, than others. But it was clearly designed to facilitate much more. The Obama administration’s policy, enacted not by an act of congress, but merely by overzealous bureaucrats, reclassified the Internet, in toto, as a Title II telecommunications service. 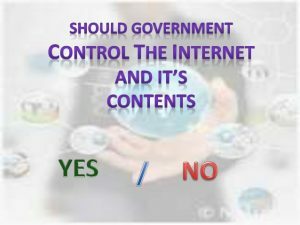 Such a designation would allow the government to regulate the Internet based on the Communications Act of 1934, just like the telephone industry. According to the regulation, broadband usage must be shared equally, without allowing providers the ability to adjust for consumption and demand, and other factors. As such, net neutrality is merely a euphemism for broadband socialism – everyone gets their “fair share,” regardless of needs. What began simply as a complaint against one broadband service provider (BSP) resulted in an attempt by the FCC to take control of the internet. In 2007, Comcast, the largest BSP slowed down traffic for peer-to-peer (P2P) networks. They argued that traffic from P2P networks, which is just a small fraction of the total number of users on their system, was slowing traffic for all of the rest of their users. The FCC claimed that Comcast’s actions were illegal, but a District of Columbia court of appeals ruled that the FCC had no authority to regulate how the BSP’s manage traffic to their consumers. The FCC then granted itself the power, in 2015. Now, to illustrate how asinine net neutrality is, let’s look at some real-life, everyday usages of internet broadband services. If a user is accessing newspapers or mostly text-laden pages, the demand for bandwidth is not that great. Once the page is loaded, it’s mostly static (except for video commercials) so no more bandwidth is required. However, for those who stream movies on Netflix, Youtube, Amazon Prime, or a host of other streaming services, there are serious bandwidth requirements to facilitate the streaming of video content. 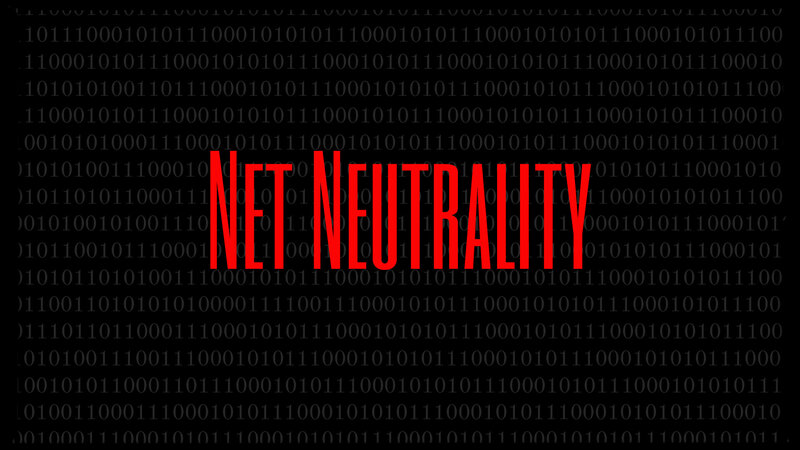 Under net neutrality, text-based content was assured to have the same bandwidth guaranteed to users as were the streaming video content providers. This makes as much sense as guaranteeing a 90 year-old driver the same performance speed as a 20 year-old driver. Not everyone need a Lamborghini or a Porche! 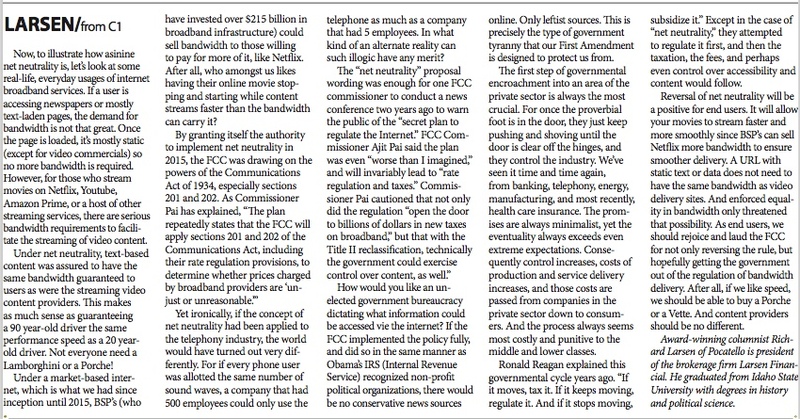 Under a market-based internet, which is what we had since inception until 2015, BSP’s (who have invested over $215 billion in broadband infrastructure) could sell bandwidth to those willing to pay for more of it, like Netflix. After all, who amongst us likes having their online movie stopping and starting while content streams faster than the bandwidth can carry it? Yet ironically, if the concept of net neutrality had been applied to the telephony industry, the world would have turned out very differently. For if every phone user was allotted the same number of sound waves, a company that had 500 employees could only use the telephone as much as a company that had 5 employees. In what kind of an alternate reality can such illogic have any merit? How would you like an unelected government bureaucracy dictating what information could be accessed vie the internet? If the FCC implemented the policy fully, and did so in the same manner as Obama’s IRS (Internal Revenue Service) recognized non-profit political organizations, there would be no conservative news sources online. Only leftist sources. This is precisely the type of government tyranny that our First Amendment is designed to protect us from. The first step of governmental encroachment into an area of the private sector is always the most crucial. For once the proverbial foot is in the door, they just keep pushing and shoving until the door is clear off the hinges, and they control the industry. We’ve seen it time and time again, from banking, telephony, energy, manufacturing, and most recently, health care insurance. The promises are always minimalist, yet the eventuality always exceeds even extreme expectations. Consequently control increases, costs of production and service delivery increases, and those costs are passed from companies in the private sector down to consumers. And the process always seems most costly and punitive to the middle and lower classes. Ronald Reagan explained this governmental cycle years ago. “If it moves, tax it. If it keeps moving, regulate it. And if it stops moving, subsidize it.” Except in the case of “net neutrality,” they attempted to regulate it first, and then the taxation, the fees, and perhaps even control over accessibility and content would follow. 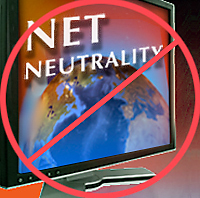 Reversal of net neutrality will be a positive for end users. It will allow your movies to stream faster and more smoothly since BSP’s can sell Netflix more bandwidth to ensure smoother delivery. A URL with static text or data does not need to have the same bandwidth as video delivery sites. And enforced equality in bandwidth only threatened that possibility. As end users, we should rejoice and laud the FCC for not only reversing the rule, but hopefully getting the government out of the regulation of bandwidth delivery. After all, if we like speed, we should be able to buy a Porche or a Vette. And content providers should be no different.